For a GPS device that can be used in a car for street navigation, but will also serve as a proficient backcountry and boating navigator, there are choices. Until recently, it was advised that there were some devices that could cross over some uses, but with a lot of compromises. Then, along came the Garmin Montana, and now the recommendation is easy. True multi-purpose GPS — car, backcountry, water sports. Heavy (10.2 oz) and somewhat bulky (2.9" x 5.7" x 1.4") compared to single-purpose devices. The Montana does what Garmin claims it will do: provide spoken-street-name, turn-by-turn directions while mounted on a car windshield mount; serve as a proficient backcountry navigator, showing detailed topographic maps on a color, moving-map display; and serving as a ruggedized, waterproof GPS for just about any other activity you can do outdoors. This all comes at a price, both in terms of the hardware itself and the extra maps you'll need to bring out the best in the Montana. It comes in three versions: the 600, 650, and the 650t. The physical specs for these models are nearly identical. The differences come in the built-in camera (the 600 model doesn't have one), memory (the 650t has 3.5GB built-in, vs. 3.0GB for the others) and preloaded maps. The 600 model sells for as low as $470, while the 650t sells for about $650, including topo maps. One of the problems of creating a crossover GPS has been battery life. Car GPS devices don't need much battery life because they are usually plugged into the power port. A backcountry GPS needs as much battery life as you can get, and your life may depend on it. Garmin neatly solved this in the Montana line by using a rechargeable (and easily removable and replaceable) lithium-ion battery pack with a 16-hour charge, in addition to having the capability to accept three AA batteries with a 22-hour lifespan. You may also charge the Li-ion from a USB car power port charger. If you start your trip with a full charge on the Li-ion battery and carry spare AAs, you can power the Montana for a very long time. We extend battery life in the field by using the GPS only when we need it, rather than keeping it on all of the time. These battery options add weight and bulk to the Montana, but they are worth the trade-off. The Montanas have a 4-inch (diagonal) color-mapping resistive touchscreen that we found to be amply bright and with reasonably good resolution. 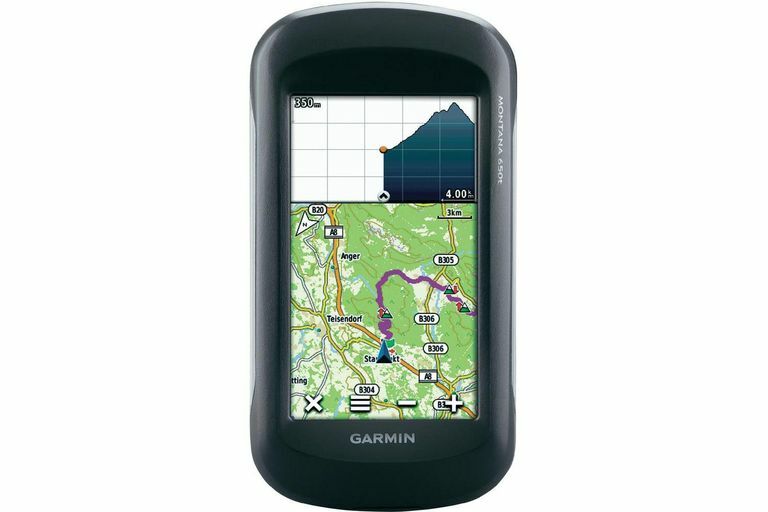 Garmin wisely placed all of the functions in a scrollable home screen, including the map, "where to," compass, and mark waypoint on the first screen. Scrolling down takes you to setup, trip computer, camera, elevation plot, 3D view, photo viewer, geocaching, and more. Additional screens open up a wealth of options, including a waypoint manager, route planner, and sun-and-moon calendar. The Montana is billed as an "everything including the kitchen sink" GPS, and we certainly have to agree with that. The Garmin Montana 650t version we tested comes with Garmin's TOPO U.S. 100K maps, and we added an SD card version of Garmin's City Navigator map set to fully enable turn-by-turn street directions and points-of-interest. You may also install a wide range of maps, from more-detailed regional topos to whitewater and equestrian maps, to trail maps, to marine charts. In keeping with the multi-use theme, the Montana screen automatically switches between portrait and landscape screen modes. We used the Montana in the landscape mode while driving, and its screen looked and behaved much like a Garmin auto GPS. Once you reach your destination, it's easy to switch to mapping mode and perform all the functions you'd expect from a good color-mapping-screen handheld, including waypoints, tracks, trip computer, elevation plots, and detailed topo maps. You may also buy and download Garmin satellite imagery. The Montana 650 and 650t models have a built-in 5-megapixel camera. The lens is on the back of the unit and is somewhat shielded by being recessed into the case. The Camera function is easily accessible from the main menu. Tap on camera, and you are presented with a simple viewfinder with adjustable zoom. We took a number of photos with the camera and found the quality to be acceptable. The big advantage of the camera is the fact that it's always with you, and completely waterproof, unlike smartphone cameras. Overall, the Garmin Montana fulfills its promise as a true, rugged and durable, multi-purpose GPS. It is nice to have one unit all set up for a big trip, with one set of charging cables and mounts to serve all nav functions, plus the assurance that you'll have the battery power (with spare AAs) to go the full distance. Its construction truly is rugged and waterproof. The Montana took plenty of abuse while we used it, including ending up at the bottom of a drift boat getting kicked around, and immersed in gritty water, and it kept on working flawlessly. "Take charge of your next adventure with BaseCamp™, software that lets you view and organize maps, waypoints, routes, and tracks," states Garmin. "This free trip-planning software even allows you to create Garmin Adventures that you can share with friends, family or fellow explorers. BaseCamp displays topographic map data in 2-D or 3-D on your computer screen, including contour lines and elevation profiles. It also can transfer an unlimited amount of satellite images to your device when paired with a BirdsEye Satellite Imagery subscription."